Synopsis : List of awareness ribbon colors and associated causes regarding health and disability - Includes printable awareness ribbon chart. The use of various colored ribbons is designed to create public awareness to health, medical conditions, disability, and other issues. Awareness ribbons are defined as short pieces of colored ribbon folded into a loop, or representations of such, which are used in the United States, Canada, Australia, UK and other parts of the world as a way for wearers of the ribbon(s) to make a statement of support for a cause or issue. Many different groups, foundations and organizations have adopted ribbons as symbols of support or awareness - as a result, various causes may often share the same, or similar, ribbon color(s). How Many Awareness Ribbons Are There? 16 different colored cancer type awareness ribbons. With new awareness days, weeks, and months, and ribbon colors, designs and symbols being created for causes, conditions, and cancer awareness, we're not sure how many there are, but as seen below there are a lot! Disabled World does not guarantee accuracy or legal status of these ribbons and/or their causes. Before using any ribbon colors and/or designs for any reason thoroughly research all current existing ribbon designations and causes. As many awareness ribbon colors may have multiple associated meanings we only list ribbons regarding health/disabilities. 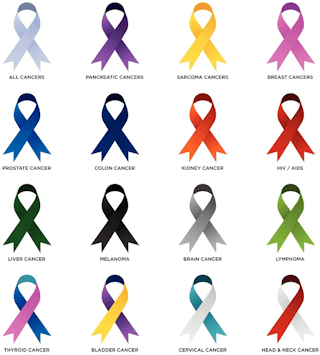 Due to different groups, organizations, countries, as well as people often creating different colored ribbons for the same cause, we may have a condition/disease listed several times under various ribbon colors. How to correct, register, or submit an awareness ribbon color or design. Pierre Robin Syndrome, Pierre Robin Malformation, Pierre Robin Sequence, Pierre Robin Anomaly, Pierre Robin Anomalad). Hydrocephalus Awareness - Light blue and dark blue ribbon with a drop of water on it. Crimes against targeted individuals of organized stalking and electronic harassment awareness. Herpes Simplex Virus Awareness - HSV 1 is the oral version of the virus, and HSV 2 is the genital type. HSV is NOT part of standard STD screening, is highly contagious and there is no cure. Hepatitis B and Liver Cancer - The Jade Ribbon Campaign was launched by Asian Liver Center at Stanford University in 2001. The awareness color for Stuttering is Sea Green (Sea Foam Blue). Reflex Sympathetic Dystrophy (RSD) - Complex Regional Pain Syndrome (CRPS). Appendix Cancer - Extremely rare condition, affecting an estimated 600 to 1,000 Americans each year. Primary lymphomas can occur in the appendix. Testicular Cancer. There is debate about the color for testicular cancer awareness and ribbons, however orchid, a purple/violet color, has long been recognized as the official color for testicular cancer. Purple and Silver are the colors representing International Overdose Awareness Day (IOAD). Silver is the awareness color for drug overdose (fatal or nonfatal), and purple is the awareness color for opioid addiction. Reflex Sympathetic Dystrophy (RSD) - Complex Regional Pain Syndrome (CRPS). Now uses the Multi-colored flame ribbon. The Autism Infinity Symbol is becoming a popular alternative to the puzzle pieces autism symbols as well as a symbol for Neurodiversity. Represents the fight against colorectal cancer. The hope is the Blue Star Universal Symbol will be integrated into existing group awareness efforts and incorporated into materials as a representation of the collective fight against colorectal cancer. The checkered eye is a wearable symbol indicating its wearer has a vision disability. It is a simple line drawing of an eye, the center (iris) is black and white checkers. The symbol bears the Checkered Eye and the text "LOW VISION". Black and white checkered awareness ribbon denotes "Blindness is a Spectrum". Congenital diaphragmatic hernia awareness. Congenital Diaphragmatic Hernia (CDH) is a birth defect, occurring while the fetus is developing. The awareness ribbon colors for Psoriatic Arthritis (PsA) is Dark Blue for Arthritis, and Orange/Orchid for Psoriasis. Blue Diabetes Circle Awareness. The awareness ribbon color for Diabetes was gray, however diabetes is now symbolized by the blue circle, as designated by the International Diabetes Federation. Lichen Sclerosus awareness ribbon for a chronic skin disease. The shade of purple may change, but the white spots and figure 8 shape is the main identifier. Multi-colored puzzle ribbon with the words "Developmental Disabilities Awareness - Normal is Over-rated" on one side. Folded teal colored Lichen Sclerosus Awareness ribbon (U.K.) with the black printed words "Lichen Sclerosus" on one end and "Awareness" on the other end. FOXG1 is a severe neurological condition characterized by seizures, small head size, inability to control body movements, and lack of speech. Complex Regional Pain Syndrome (CRPS) - Formerly known as Reflex Sympathetic Dystrophy (RSD). Pink Ribbon Red Ribbon will expand the availability of vital cervical cancer screening and treatment and breast care education. Prurigo Nodularis (PN) awareness ribbon features a reddish color fading to "pinkish" with dots at the ends and the words Prurigo Nodularis printed on one side. Trisomy Awareness ribbon - Created by the Support Organization for Trisomy to represent all forms of Trisomy. The ribbon features a mosaic pattern of red, blue, and yellow colors, with the words "Mosaic Trisomy Awareness" printed on it. The Mint green and golden yellow butterfly symbol is used to raise awareness of Beckwith-Wiedemann Syndrome (BWS). Tethered spinal cord syndrome - Closely associated with spina bifida. Black and White Striped Breast Implant Illness (BII) awareness ribbon with the words "Breast Implant Illness" printed black on white background. Intestinal Malrotation - A congenital birth defect affecting the positioning of a person's intestines. The Spina Bifida Association ribbon color is blue and teal and represents all forms of Spina Bifida including Occult Spinal Dysraphism, Spina Bifida Occulta, Meningocele and Myelomeningocele. Suicide awareness and prevention (also see yellow ribbon). Spina Bifida and Hydrocephalus - Ribbon incorporates combined colors of both Spina Bifida (Yellow) and Hydrocephalus (Two Tone Blue ribbon with water drop on the side ). The Persistent Cloaca ribbon is brown to symbolize bowel issues, and the pink dots symbolize occurrence in females only. Arachnoiditis - Purple is for neuropathy and burgundy for meningitis. Body-focused Repetitive Behavior (BFRB) - General term for related complex disorders including hair pulling, skin picking, nail biting. Multi-colored with the words "Hypotonia Awareness - One Inchstone at a Time". Idiopathic Hypersomnia - Disease characterized primarily by severe excessive daytime sleepiness (EDS). Oral cancer ribbon consists of three colors; Lilac which is the universal color of Dentistry or Oral Stomatology, White and Red representing Leukoplakia and Erythroplakia (white and red spots respectively) which predominantly considered as tissue manifestation seen in most of the oral pre-malignancy (cancer) conditions - Awareness ribbon design credit: Arturo P. De Leon, DMD, MAEd, FPPS; Dean of College of Dentistry, Our Lady of Fatima University, Current President Philippine Association of Dental Colleges - Larger ribbons to help spread awareness can be found at: Ribbon 1 - Ribbon 2 - Ribbon 3. The official awareness ribbon color for Spinal Muscular Atrophy (SMA) is Ivory and also includes a rose picture. MEF2C Haploinsufficiency Syndrome - Neurodevelopmental disorder associated with intellectual disability, autistic features, epilepsy, and abnormal movements. The Mandibulofacial Dysostosis with Microcephaly ribbon is royal blue with a yellow border, and yellow letters MFDM on the left bottom portion of the ribbon. The ribbon design combines craniofacial and microcephaly colors. Clubfoot - A clubfoot, or talipes equinovarus (TEV), is a birth defect. The foot is twisted in (inverted) and down. Without treatment , persons afflicted often appear to walk on their ankles, or on the sides of their feet. Ponseti International Association (PIA) has designated June 3rd as World Clubfoot Day. Tracheostomy Awareness - The ribbon is 2 tone with one side being purple and the other black. Necrotizing Enterocolitis (NEC) Awareness - Right half of the ribbon is purple and the left half is black. GNA01 Gene Mutation Disorder - The awareness ribbon is colored purple and blue with the words "Epilepsy" written on the purple part and "Movement Disorder" written on the blue part. Sphincter of Oddi dysfunction (SOD) - Purple/Green Ribbon with the words "Sod Awareness" printed in white on the purple side. Stickler Syndrome - Also known as hereditary progressive arthro-ophthalmopathy. Schizencephaly - Purple for epilepsy and green for cerebral palsy. The Necrotizing fasciitis - Purple and teal with white stars representing those who lost the battle with this disease. Medullary Sponge Kidney ( Cacchi-Ricci disease ). Sarcoidosis - Snowflake signifies no two Sarcoidosis Sufferers are affected in the same way. Dissociative Identity Disorder (DID) - Multiple Personality Disorder (MPD). Hashimoto's Encephalitis, Hashimoto's Encephalopathy, Non-vasculitic Autoimmune Meningoencephalitis, Steroid-responsive Encephalopathy associated with Autoimmune Thyroiditis. Rare Adipose Disorders, Dercum's Disease (Adiposis Dolorosa), Madelung's Disease (Launois-Bensaude Syndrome), Multiple Familial Lipomatosis MFL and Multiple Symmetrica. Neonatal Alloimmune Thrombocytopenia (NAIT) Awareness (NAITP or NAIT or NATP or NAT for short; or fetal and neonatal alloimmune thrombocytopenia, FNAIT, feto-maternal alloimmune thrombocytopenia, FMAITP or FMAIT). Pernicious Anaemia and B12 Deficiency - Two awareness ribbons are listed for Pernicious anemia, both ribbons are colored red, white and black. The second ribbon has the words "Pernicious Anaemia" written on the black part, and B12 Deficiency on the red part. Pernicious Anaemia is believed to be an autoimmune disease. Courtesy of Georgia Dent (B12ribbons@outlook.com), Ribbon design is copyrighted. Granuloma Annulare Awareness - Granuloma annulare is a chronic skin condition that causes raised reddish or skin-colored bumps (lesions) in a ring pattern, usually on the hands and feet. How Do I Register an Awareness Ribbon Color or Design? Awareness Ribbons are not a centralized idea, there isn't really an official place to go to register a design, or color. Currently, awareness ribbons are considered to be in the public domain in most countries, and a simple ribbon of a particular color is generally not considered sufficiently original and/or creative enough to be copyrighted by a person - or group. However, in a few cases several particular designs have been granted a special trademark status. Eg. Canada has granted "official mark" status for the pink (breast cancer) awareness ribbons to the Canadian Breast Cancer Foundation. If you are designing your own awareness ribbon and need color ideas, check out our comprehensive list of HEX and RGB color codes. How Do I Submit an Awareness Ribbon Color or Design? When submitting an awareness ribbon, or design, please provide an example(s) of where the ribbon is currently used, e.g. web-page address, organisation etc. Do NOT post, or redesign, awareness ribbons that are trademarked - (TM), (R). Some ribbons, including style, color, and design are copyrighted, you should thoroughly research the ribbon design you are wishing to submit to avoid possible copyright infringement. To avoid listing several different ribbons and/or designs for the same cause the awareness ribbon and/or design you wish to submit MUST be recognized as the most popular one chosen for the cause it represents - Different styles and colors recognised by different countries are OK.
To submit an awareness ribbon, or if you know a ribbon/cause we have listed is not correct, or if you know of an awareness ribbon color or cause we have missed, please contact us. An awareness band, awareness bracelet, or wristband, is defined as a bracelet of various colors on which a slogan is sometimes written, usually sold to raise awareness for charitable causes. These plastic wristbands are available in nearly every color, or colors, and are constructed from material such as silicone, fabric, rubber, or plastic. Awareness bracelets sometimes carry embossed messages demonstrating the wearer's support of a certain cause, or charitable organization. Awareness bracelets generally use the same, or similar colors to awareness ribbons. Cancer Awareness: Color Chart of Ribbon Colors for Cancers - List, table and printable chart outlining the colors of awareness ribbons that represent different types of cancer and their causes. Mood Colors: Meaning and Associations of Color Psychology - Chart showing various colors, the color meaning and what it symbolizes, for those who may be looking for ideas in designing new colored awareness bracelets and ribbons. Calendar of US and International Awareness Days, Weeks and Months - List of U.S. National and U.N. International commemorative observance and awareness days, weeks, months to commemorate medical research or ethical cause of importance. Notable LGBT Awareness Dates and Events - List of important LGBT+ community awareness remembrance dates and coming events in respect to sexual orientation, gender identity, transgenderism, transsexualism, and intersexuality. U.N. International Awareness and Commemorative Dates - List of International days of observance established by the United Nations (UN), World Health Organization (WHO) and United Nations Educational Scientific and Cultural Organization (UNESCO). List of U.S. Presidential Proclamation Dates - List of annual awareness and observance dates including days, weeks and months, as recognized by U.S. presidential proclamation.